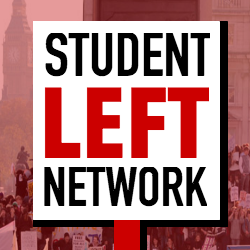 Founded at the Student Activist Weekender in September 2018, we are a broad coalition of student activists involved in campaigns to transform our universities, education and society. We aim to unite and renew the student left and go on the offensive to transform education and society. We are on the radical left: we fight for a society based on social ownership and radical democracy, where production is organised to serve human and environmental need rather than profit. We believe working-class struggle is the agency for winning such a society. We recognise that climate change is a class, race and gender issue. We are internationalists and defend free movement and migrants’ rights. The 2018 UCU pensions struggle saw strikes at over 60 institutions, roaming pickets, national demonstrations and a wave of 26 occupations. We aim to take the solidarity and the politics of this struggle forward to build a robust movement to fight back, bringing together thousands more student activists. We aim to democratise and radicalise the institutions of NUS and student unions. We want to break the bureaucracy and political culture which dominates them. Our left representatives need to be supported, and pressured, by a well-organised movement. We want to bring our shared struggles into the NUS to transform it into a political fighting force over which students have real control. Those of us in the Labour Party will campaign in Labour Students for democracy and for the demands and principles in the left unity charter. We need a left youth movement in Labour that organises openly around radical demands and puts left pressure on the Labour leadership to fight for students and workers, regardless of their country of origin. We will also work within and welcome comrades from other parties on the left as well. To be effective the left must organise openly and democratically around a clear set of political ideas: we must work together where we agree, and debate and discuss our disagreements. We call for the student left to unite around the following unity charter. This is inevitably an incomplete set of goals, but it forms our common ground as activists in the student movement.